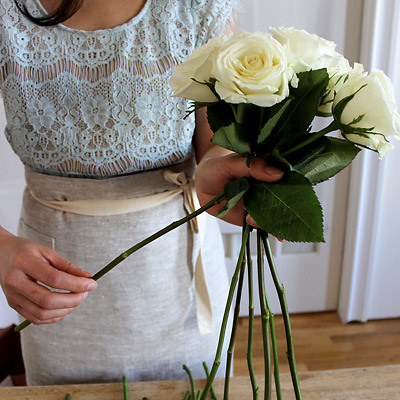 Making the perfect bouquet is truly a mysterious art. An art we desperately wanted to master, or if not master, at least understand and attempt. 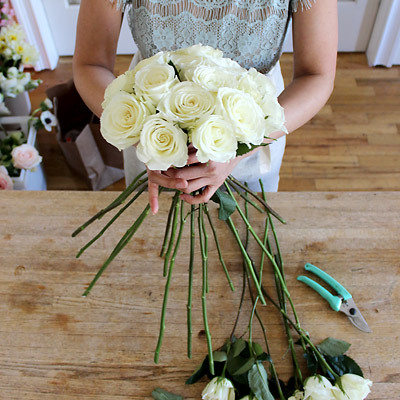 We knew we needed the best of the best to help us, so we hunted down the talented Doan Ly, Lead Floral Designer of Sprout Home in Brooklyn (and Chicago). 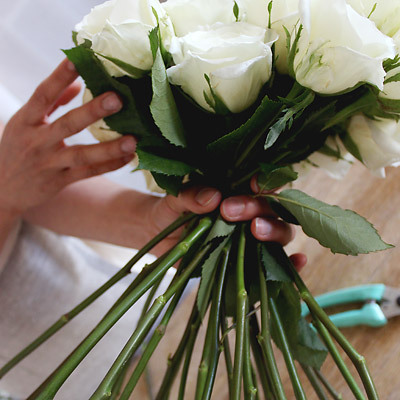 In this Toolbox, she takes us step by step through creating a beautiful hand-held bouquet, and drops some tips as she goes. 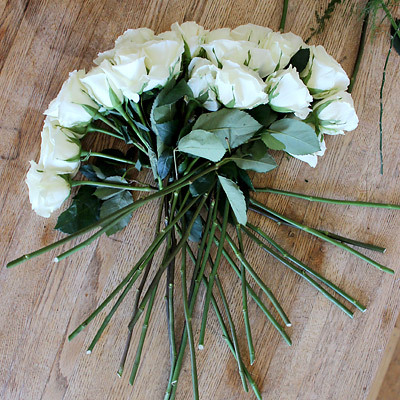 Flower arranging is the act of combining different flowers together to produce a visually pleasing display. 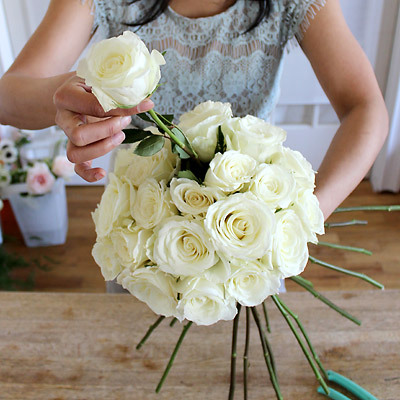 Flowers can be arranged for free standing sculptures, display within a vase, or display in the form of a bouquet. A flower arrangement can be accented by a sculpture or statue, or may simply be accented by the impact of a single color flower. 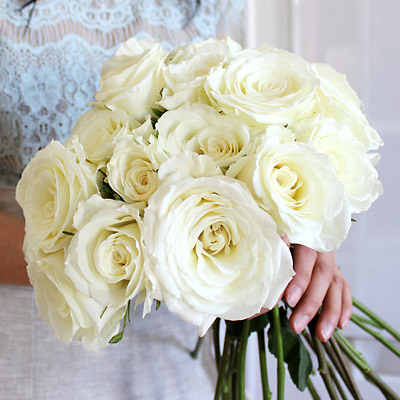 Open flowers also add accent to the arrangement. • Flowers - the choice of flowers and colors is up to you. Using filler flowers is an optional choice, as is moss or vines. 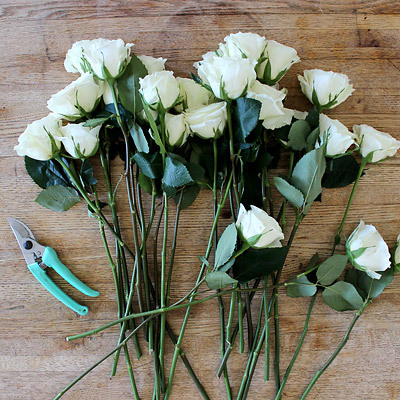 • Clippers - use the clippers to cut the stems to size. GATHER a few, sturdy stems to form a base. PLACE one stem over another stem at a 45 degree angle, overlapping at the base of the bud . 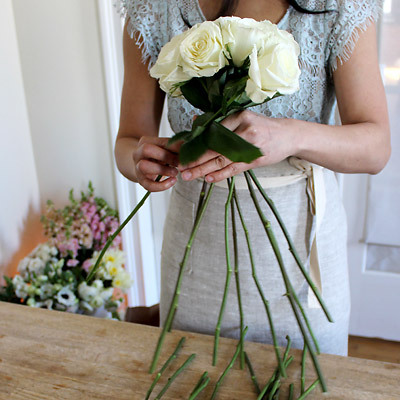 ROTATE the stems in your hand as you add more flowers, always keeping the placement at angle so the stems form a spiral. 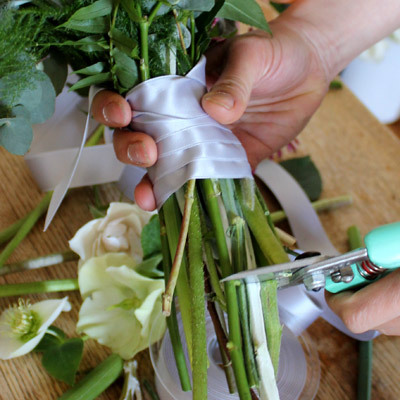 It will feel awkward at first, but when many stems have been layered in, it will feel more secure, with all the stems wrapping in the same direction. No stems should cross each other, only overlap. 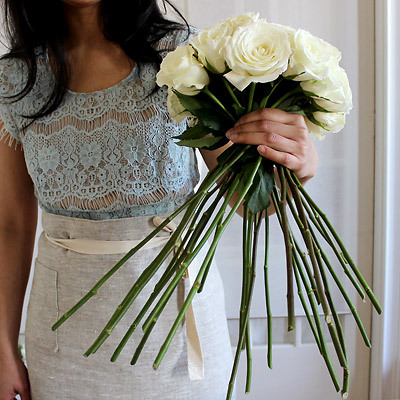 This spiral technique allows you to insert or remove flowers as you design, and is the key to a successful bouquet. 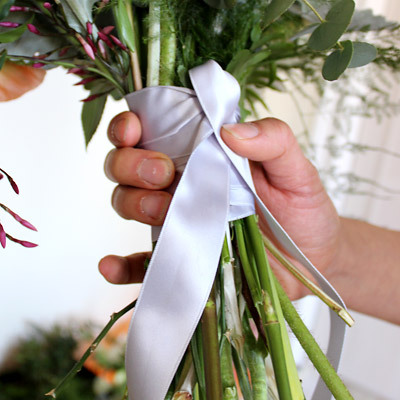 Since no stems are crossed over each other, flowers should easily slide in and out. 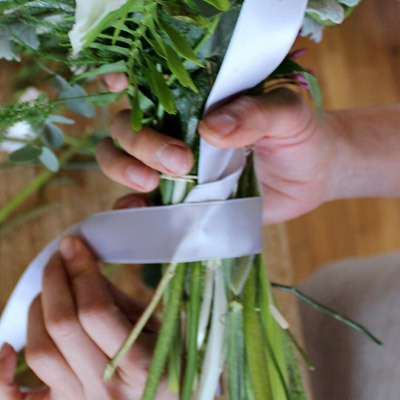 ADJUST the height of each flower to create a variety of shapes from an even round ball, the classic wedding bouquet shape, to a more flowing, organic shape of wildflower bouquets. always keeping the angle so the stems form a spiral. 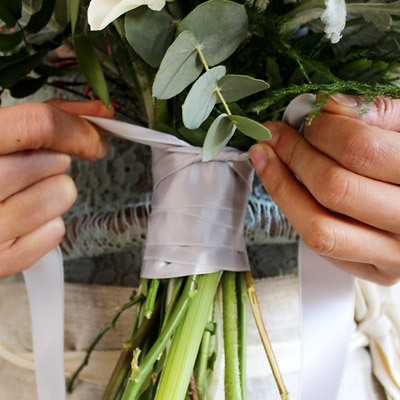 DRAPE one end of the ribbon over the bouquet and secure it down with your thumb, leaving enough extra ribbon draped to tie. WRAP about six inches down the stems. 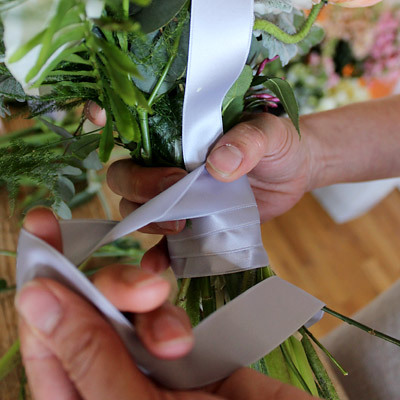 FOLD one corner of the ribbon to a 45 degrees, and wind the ribbon around the bouquet, overlapping the middle of the previous layer of ribbon until you reach about an inch or two from the flowers. Be sure to keep an equal distance of overlapping to keep a neat looking wrap. TIE your ribbon and secure it with a pearl pin, or a bow, as you wish. 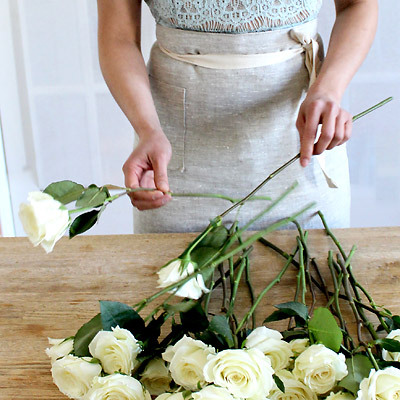 TRIM the stems one last time, if needed, to keep the right proportion of stems to the size of the bouquet (shorter than you may think). • Choose flowers with fresh looking foliage. A sure sign that flowers have been sitting around the store is yellowed or crispy leaves. • Remove as much foliage as possible that might get submerged in the vase. These leaves will rot in the water, causing bacteria to grow, shortening the flower life, and making the water smell. 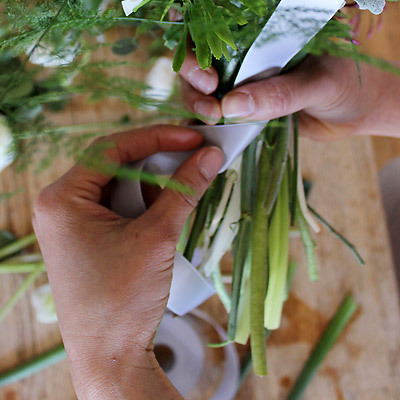 • Cut all stems at a 45 degree angle to expose a larger surface area for water absorption. • Change the water frequently to cut down on bacterial growth, recutting the stems as you do so. • Flowers will last longer in a cooler room. • Odd numbers are your friends. Two or four of the same flowers will be static and symmetrical, while three or five will be more dynamic. • Handheld bouquet techniques are used in making bridal bouquets, as well as centerpieces that are low and lush, and seen all around, such as dining room centerpieces. Learn how to needle felt. 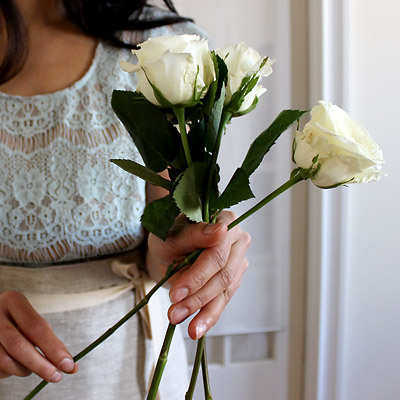 The lovely Doan Ly of Sprout Home, teaches us how to arrange a bouquet like a professional. Distract from your lack of cooking skills with a beautiful table.